Sam and his older brother, Nathan, are Team Dinosaur. Nathan is the Captain and he knows everything about dinosaurs. Sam is Second-in-Charge. But Team Dinosaur might be broken up—Sam’s mum is so mad when his fifth lot of homework goes missing (stolen by a pterodactyl, but she doesn’t believe that) that she threatens to send Sam to a school for naughty boys instead. Sam and Nathan have to find a way to get that homework back. They have to find a way to get up Saurus Hill to find the homework-stealing pterodactyl. This is a funny chapter book for younger readers who love dinosaurs—and who doesn’t love dinosaurs? There are also cool black and white illustrations on almost every page and the adventures are chock-a-block full of pterosaur facts. You can download the first few pages of the book for free on the Random House Australia website. 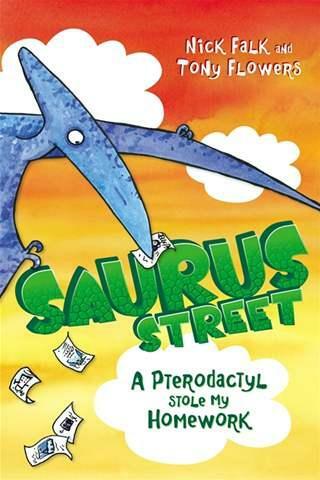 And best of all, this is book two in the Saurus Street series—there are more Saurus Street adventures to read. Excellent!